IMPORTANT NOTICE: Ticketmaster is the only authorised seller of tickets to Palais Theatre events. We strongly recommend that you only purchase tickets via Ticketmaster to ensure you receive a legitimate ticket and can therefore enter the Venue. See below, 'Unauthorised Ticket Sellers' for additional Information. All tickets for Palais Theatre events are available through Ticketmaster. To speak to an operator call 136 100, Option 1 followed by Option 2. For Accessible Seating call 136 100, Option 1 followed by Option 2. Accessible Seat Map HERE. More information on Accessibility HERE. Ticketmaster is the only authorised seller of tickets to Palais Theatre events. Palais Theatre advises caution when purchasing tickets through unauthorised sellers or third parties such as Viagogo, StubHub, Ebay or Gumtree online auctions. We strongly recommend that you only purchase tickets via Ticketmaster to ensure you receive a legitimate ticket and can therefore enter the Venue. Viagogo, StubHub, Gumtree, eBay and Ticketmaster Resale are onsellers of tickets and may sell tickets at an inflated price. Always check prices via ticketmaster.com.au. Some unscrupulous sellers may also sell the same tickets multiple times meaning you will not be able to enter the Venue for your event. Ticketmaster or the Palais Theatre are not able to verify if your tickets are legitimate as they have not been purchased on our system. 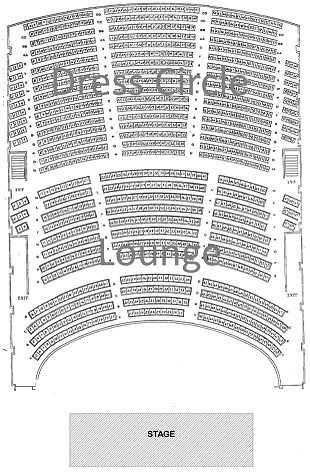 For numbered seating maps of the Orchestra, Stalls, Lounge & Dress Circle CLICK HERE. Most events will open Interactive Seating Maps so you can select your seats. For busy onsales the system will automatically turn off Interactive Seating Maps and allocate seats as Best Available. You can also choose for the system to allocate Best Available by selecting FIND SEATS FOR ME in the Ticketmaster system. Seats will be allocated from the centre front of the Orchestra and as the seats move back in the Stalls the system will move to the centre front of the Lounge upstairs. It will then move back down to the Stalls and so on. You can feel confident that as per the venue's recommendation, you will be allocated the first seats available for sale that are considered to be closest to the stage. Orchestra seats are located on the ground level in the front half of the auditorium. 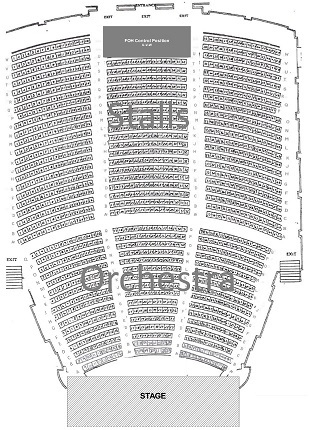 The front row is A and the back row is Q.
Orchestra seating is not a pit under the stage, it is our prime seating location on the Ground Level located directly behind the original orchestra pit. All seats are considered excellent viewing. Stalls seats are located on the ground level directly behind the Orchestra. The front row is A and the back row is W.
The Prime seats in the Stalls are A-J, however all seating downstairs can be considered a good seat in this venue. The ground floor is raked (has an incline) towards the stage and the stage is raked towards the audience creating a feeling of being much closer than seats appear on the map. The front section of Level 1 is the Lounge. The front row is A and the back row is M.
It is a traditional seated area, however the seats are slightly wider than the Orchestra, Stalls and Dress Circle. Anything in the Lounge can be considered a good seat in this venue. Prime seats in the Lounge are A-D* - *please note Rows A-D seats are strictly no standing for safety reasons. As the balcony is very low, standing in this area poses a substantial safety issue. We enforce a no standing policy at all times to ensure that we do not have an incident whereby a patron standing in these rows loses balance and in doing so, causes someone to fall. Many patrons who frequent events at the Palais Theatre now choose seats in the Lounge as they are assured of an uninterrupted seated view of the performance. The back of Level 1 is called the Dress Circle. It sits directly behind the Lounge. Prime seats in this area are rows N-P. The view of the stage and the acoustics of the performance from the Dress Circle are as good as anywhere else in the venue, however it is at this point where you do feel the distance from the stage. A $5.95 Handling Fee applies to purchases made through the ticket system (per transaction, not per ticket) by telephone, internet, mobile device or mail. The Palais Theatre makes every effort to provide accurate information on this website, but cannot be responsible for changes to fees and charges made by the ticketing provider. On event nights the Palais Theatre Box Office is open for ticket collections 15 minutes prior to the doors opening time (as stated on the event page). To avoid queues, you can pick your tickets up when the Palais Theatre Box Office opens on event night or from any Ticketmaster outlet prior to the event. The person whose name is on the credit card is the only person who can collect a prepaid ticket. The credit card used to purchase the ticket(s) and photo I.D. must be presented at time of pick up. Before purchasing tickets, carefully review your event and seat selection. Policies set forth by our clients, generally prohibit Ticketmaster from issuing exchanges or refunds after a ticket has been purchased. Ticketmaster Purchase Policy. In the event that a patron is refused entry or removed from the venue during any part of the performance, in accordance with stated conditions, under no circumstances will a refund be offered on the ticket price. If you are having an issue during an event please notify one of our front-of-house staff as soon as possible. If you are not proactive in bringing an issue to our notice during an event, a refund after the event has concluded will not be possible. Contact Ticketmaster as soon as you notice the tickets are missing and they will explain the procedures for the event you are attending. Generally, Lost Ticket Vouchers will not be issued until 48 hours before the event. Verified Fan is a new Ticketmaster system aimed at getting tickets into the hands of fans and out of the reach of bots and resellers. When an artist decides to use the Verified Fan program, fans who want tickets have to select that specific artist as a favourite or interest in their Ticketmaster account online in advance of the onsale. Ticketmaster works out if you are a bot or ticket scalper and if you've been 'verified'. Having selected a particular artist/event in your Ticketmaster account you will be on the list to receive a notification about the event and will be emailed the option to Register as a Verified Fan. You must Register for Verified Fan for each event you want to attend in order to receive a Unique Code to use to purchase tickets. The Verified Fan registration is in addition to your Ticketmaster Account. You will receive the code approx. 4 hours prior to the presale time to reduce the chance of codes falling into the hands of unscrupulous sellers. Registering does not guarantee fans will receive a code or have the ability to purchase tickets. Presale tickets will be available on a first-come, first-served basis. If fans miss out on tickets in the Presale, there will be limited tickets available in the general public onsale and codes will not be required for this. Q: What is Ticketmaster Verified Fan®? A: Ticketmaster Verified Fan is an innovative new product built to help artists get tickets into the hands of fans who intend to go to the event, and create a better, reliable, ticket-buying experience for fans. By leveraging Ticketmaster’s technology platform and largest live event database in the world, we’re changing the mechanisms of an onsale so that the speed of bots is no longer a factor in the rush to get tickets. Ticketmaster Verified Fan has supported over 80 tours, with artists and shows like Bruce Springsteen, Taylor Swift, Pearl Jam, Ed Sheeran, LCD Soundsystem, Dead & Company, Depeche Mode, Katy Perry, Hamilton, Harry Potter and The Cursed Child, and Harry Styles using the product to gets tickets directly to fans. Verified Fan has sold three million tickets and saved fans more than $100 million relative to what they would have spent on the secondary market. This does not guarantee that every fan will get a ticket, but it does level the playing field so a fan is up against another fan – instead of a bot - that wants that same ticket. 1. An artist announces a tour and fans are directed to a responsive registration page. 2. Then, fans register in a way that identifies they are a person - by using their email address, phone number, or Ticketmaster account - and selects the show(s) they are interested in purchasing tickets to. 3. After the registration period, Ticketmaster uses its proprietary data science technology and an automated and manual process to ensure only fans participate in the purchase process. 4. Finally, each fan receives a unique code that provides them access to purchase tickets at the stated onsale time. Q: What is new about this? A: This is a major step forward in redefining how a fan gets a ticket for an event. Establishing a registration period eliminates the need to battle bots in real-time with a massive amount of traffic as fans attempt to buy tickets. It allows artists to identify fans to help strengthen the relationship through a more personalized ticket-buying experience. Q: Why did Ticketmaster build this product? A: Artists and Ticketmaster share a mission: to provide fans with the most reliable access to tickets, and combat bad actors that use bots that subvert that process. We’re invested in developing new technologies to further that mission. With more than 3 million fan registrations, 60 tours, and an average success rate of 90% in keeping tickets off of secondary markets, Ticketmaster Verified Fan has proven its success as an innovative new tool that helps artists get tickets directly into the hands of fans.